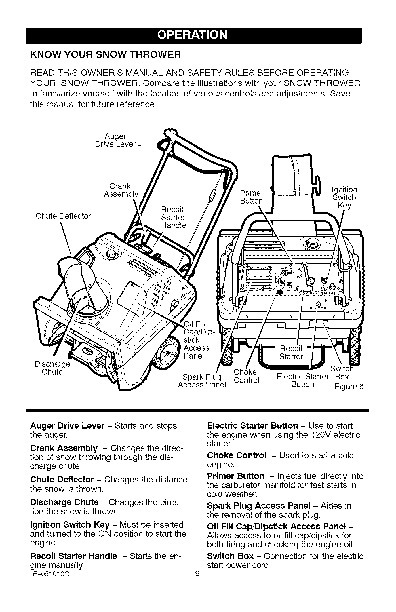 Lawn and Garden readers have rated Craftsman 536.881501 22-Inch Snow Blower Owners Manual 5.0 out of 5.0 based on 1 product reviews. Great web-site. It's very helpful. 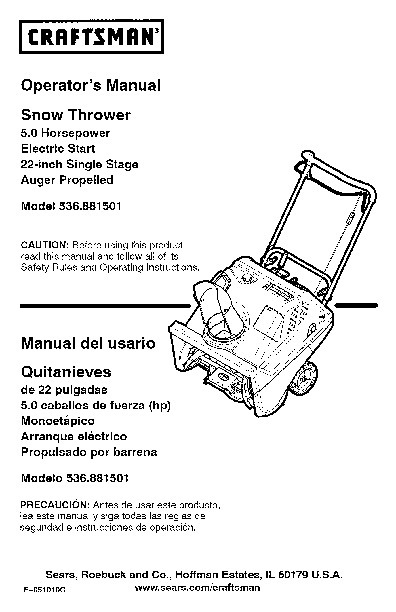 I CRRFTSMRN1 Operator’s Manual Snow Thrower 5.0 Horsepower Electric Start 22-inch Single Stage Auger Propelled Model 536.881501 CAUTION: Before using this product, read this manual and follow all of its Safety Rules and Operating Instructions, Manual del usario Quitanieves de 22 pulgadas 5.0 caballos de fuerza Monoetapico (hp) Arranque electrico Propulsado por barrena Modelo 536.881501 PRECAUCION: Antes de usar este producto, lea este manual y siga todas las reglas de seguridad e instrucciones de operaci6n, Sears, Roebuck F-051010C and Co., Hoffman Estates, www.sears.com/craftsman IL 60179 U.S.A.
WARRANTY STATEMENT SAFETY RULES . INTERNATIONAL SYMBOLS ASSEMBLY . OPERATION MAINTENANCE . 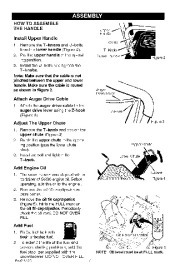 SERVICE AND ADJUSTMENT STORAGE TROUBLE SHOOTING CHART REPAIR PARTS. ENGINE REPAIR PARTS SPANISH (ESPAI_IOL) PARTS ORDERING/SERVICE LIMITED TWO-YEAR WARRANTY ON CRAFTSMAN SNOW THROWER For two years from the date of purchase, when this Craftsman Snow thrower is maintained, lubricated, and tuned up according to the operating and maintenance instructions in the owner’s manual, Sears will repair, free of charge, any defect in material or workmanship. 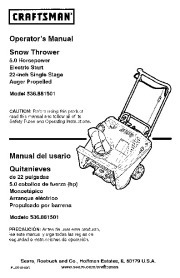 If this Craftsman Snow thrower is used for commercial or rental purposes, this warranty applies for only 90 days from the date of purchase. 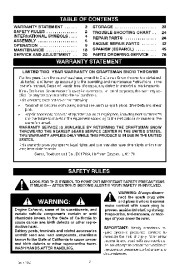 This warranty does not cover the following: · · Items which become worn during normal use, such as spark plugs, drive belts and shear pins. 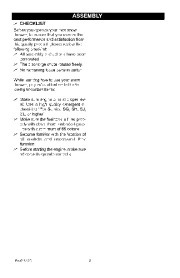 Repair necessary because of operator abuse or negligence, including bent crankshafts and the failure to maintain the equipment according to the instructions contained in the owner’s manual. 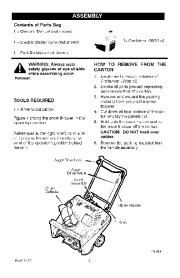 WARRANTY SERVICE IS AVAILABLE BY RETURNING THE CRAFTSMAN SNOW THROWERTO THE NEAREST SEARS SERVICE CENTER IN THE UNITED STATES. 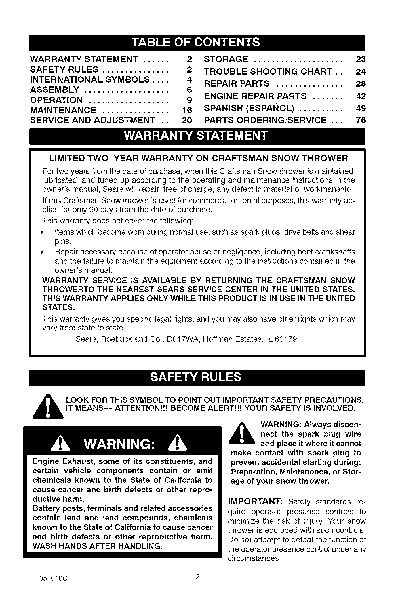 THIS WARRANTY APPLIES ONLY WHILE THIS PRODUCT IS IN USE IN THE UNITED STATES. 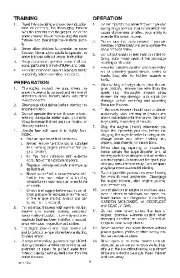 This warranty gives you specific legal rights, and you may also have other rights which may vary from state to state. Sears, Roebuck and Co., D817WA, Hoffman Estates. 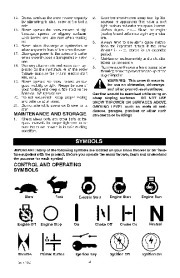 IL 60179 _k ITOOK FOR THIS SYMBOL TO POINT OUT IMPORTANT SAFETY IS INVOLVED. MEANS– ATTENTION! !t BECOME ALERT!t! YOUR SAFETY PRECAUTIONS. ,_ Engine Exhaust, some of its constituents, and certain vehicle components contain or emit chemicals known to the State of California to cause cancer and birth defects or other reproductive harm. 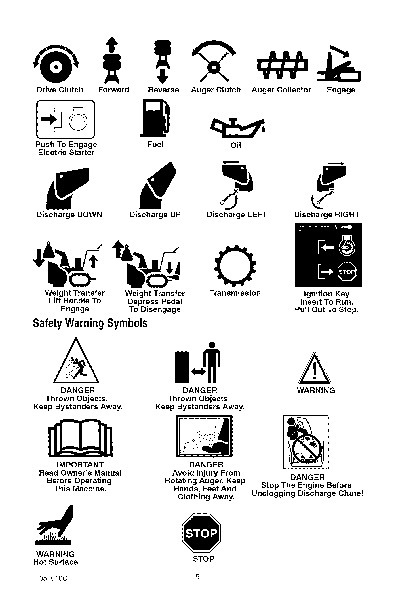 Battery posts, terminals and related accessories contain lead and lead compounds, chemicals known to the State of California to cause cancer and birth defects or other reproductive WASH HANDS AFTER HANDLING. harm. nect the WARNING: spark plug wire Always disconand place it where it cannot make contact with spark plug to prevent accidental starting during: Preparation, Maintenance, or Storage of your snow thrower. 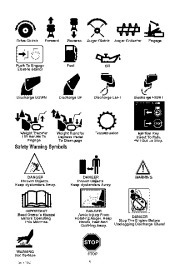 IMPORTANT: Safety standards require operator presence controls to minimize the risk of injury. Your snow thrower is equipped with such controls. 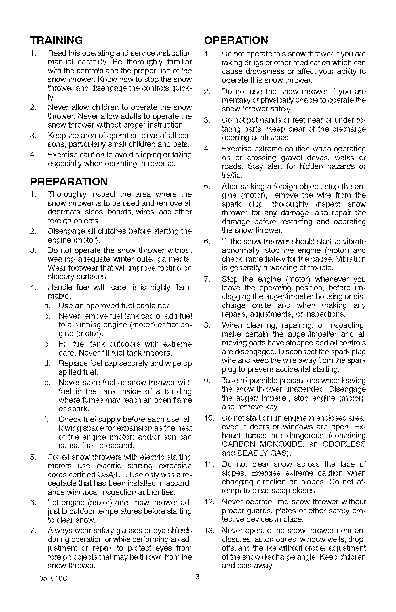 Do not attempt to defeat the function of the operator presence control under any circumstances. F-0510100 2 TRAINING 1. 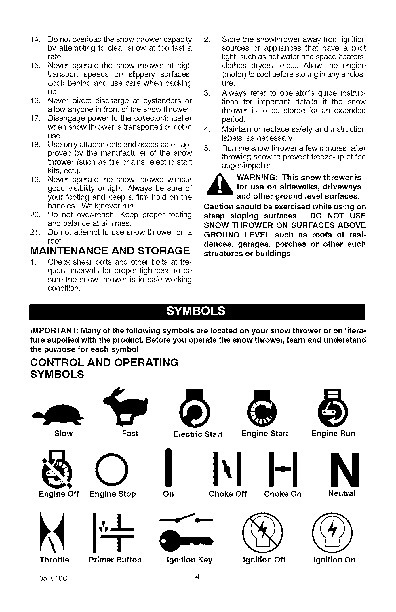 Read this operating and service instruction manual carefully. 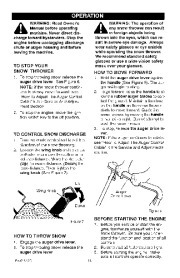 Be thoroughly familiar with the controls and the proper use of the snow thrower. Know how to stop the snow thrower and disengage the controls quickly. Never allow children to operate the snow thrower. 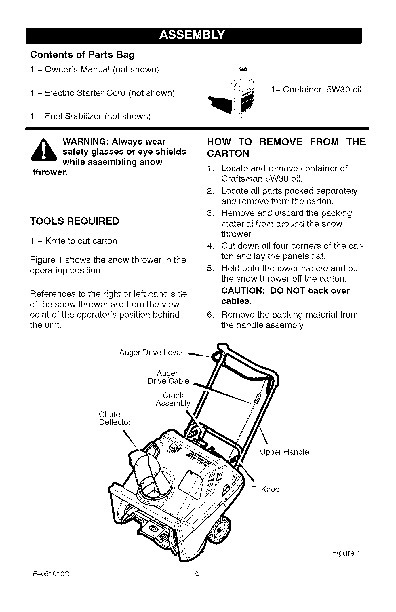 Never allow adults to operate the snow thrower without proper instruction. 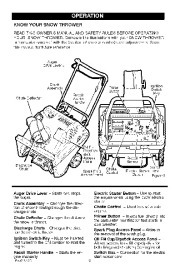 Keep the area of operation clear of all persons, particularly small children and pets.